This vegan Strawberry Rhubarb Parfait is rich and indulgent and contains all my favourite summer flavours. Strawberries and rhubarb are in season now and I cannot get enough of them. Rhubarb is quite tart and tangy on its own. The best way to eat rhubarb is to add ripe sweet fruits like strawberries, apples, peaches or cherries. Rhubarb and strawberry is a classic combination. I love using them in my crumble or to make the most divine ice cream. 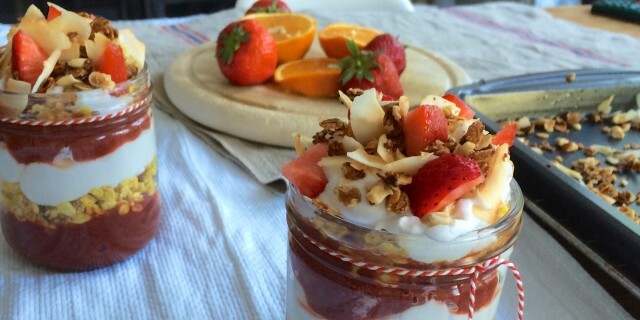 This time I made a rhubarb-strawberry compote to add to my breakfast parfait with yoghurt, overnight oats and granola. I love all the different flavours and textures of this delicious summer parfait. The strawberry-rhubarb compote is sweet and tangy. The oats soaked in (fresh) orange juice with cinnamon have a lovely citrusy and fresh flavour. The coconut yoghurt is creamy and fluffy and has a beautiful refreshing and clean taste. The granola adds a nice crunch and lovely nuttiness. This Strawberry Rhubarb Parfait makes the perfect weekend breakfast. It takes a little more preparation and planning but it’s worth it every step of the way. If you want to indulge yourself or treat your loved ones to an amazing breakfast, try this healthy and delicious Strawberry Rhubarb Parfait! Add oats to a small bowl and cover with the orange juice. Add 1 tsp of cinnamon and coconut nectar to taste if you like your oats on the sweet side. Mix everything thoroughly. Cover the bowl and place in the fridge. Let stand overnight. For the compote, add strawberries, rhubarb, 1/2 cup of orange juice and coconut sugar to a small saucepan. Bring up to a bowl, lower heat and let it summer for 20-30 minutes until you have a smooth consistency. If you’re making your own granola, pre-heat your oven to 175 degrees celsius. Add 1/2 cup of oats to a non-stick baking tray. Add honey, coconut oil and 1/2 tsp of cinnamon. Mix well until the oats are coated on all sides by the honey-coconut mixture. Toast the oats in the oven for 10-12 minutes. Then add the chopped almonds for another 4-6 more minutes. Finally, add the coconut flakes and roast for 2 more minutes or until the coconut flakes are lightly browned. Watch carefully, as they tend to burn quickly! To make your parfait, add a layer of the compote to the bottom of a jar. Then, add a layer of the overnight oats. Add a layer of coconut yoghurt and continue layering until you reach the top of the jar. Serve your parfait with crunchy granola and fresh strawberries on top.